The discovery of a new rainbowfish is always occasion for cheer among a large global network of aquarists, but when a particularly spectacular species unknown to science is found in a small pond in an abandoned mining camp deep in the rainforests of remote Papua Province, the excitement spreads. Now that fish has been described as Melanotaenia rubrivittata by Gerald Allen, et al in the Journal Fishes of Suhal, Volume 29:1. The new rainbow is related to the Neon Rainbowfish, Melanotaenia praecox, one of the the most popular of this family in the aquarium trade. Unlike M. praecox, the new species has a more elongate body with electric neon blue color and five brilliant red stripes along its flanks. Lead researcher and renowned ichthyologist Dr. Gerry Allen had first collected lab specimens in 1998, and the “neon rainbow with red stripes” became the stuff of legends. 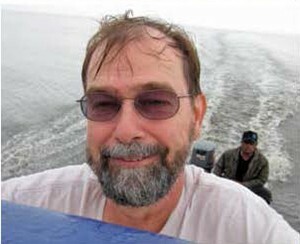 Gary Lange on the 2012 expedition to collect live breeding stock in Papua Province. In an AMAZONAS Magazine issue in 2014, writer Johannes Graf reported on a 2012 expedition to look for new rainbowfishes, including the red-striped fish from the Wapoga watershed. (AMAZONAS, Nov/Dec 2014: New Rainbows, Volume 3, Number 6.) 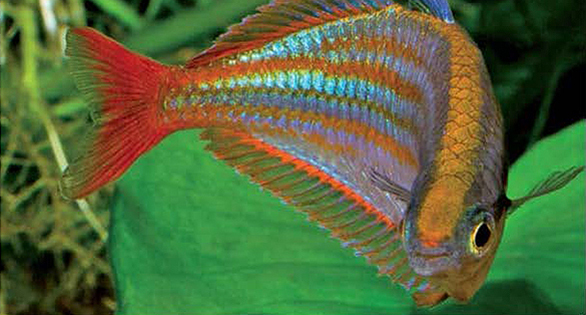 U.S. based-breeder Gary Lange, an AMAZONAS contributor, was part of the trek and he dubbed the fish with an aquarium moniker “Wapoga Red Laser” Rainbowfish. Lange was apparently also the first to photograph and breed the fish in captivity and to provide breeding stock to Hans-Georg Evers in Germany. 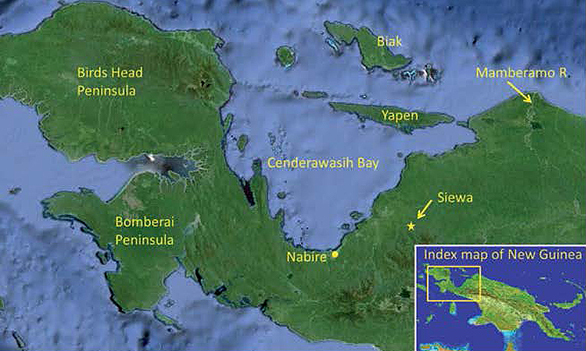 Captive breeding efforts may ensure a long and protected life for M. rubrivittatus in the aquariums of rainbowfish fanciers, even as environmental pressures mount species with miniscule endemic ranges in Papua New Guinea. M. rubivittatus adapted readily in the St. Louis fish room of AMAZONAS contributor Gary Lange. Image: G. Lange. and 28.7°C/8.0 were recorded for the respective pond and stream habitats. distinctive markings that distinguish it from the similar appearing M. praecox. 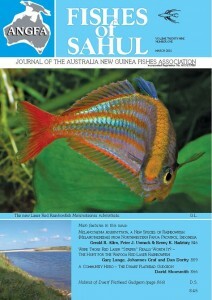 From materials provided by the Fishes of Suhal and the Australia New Guinea Fishes Association (ANGFA). James Lawrence is editor & publisher of AMAZONAS & CORAL Magazines and Microcosm, Ltd., publishers of a number of critically acclaimed and bestselling books in the aquarium field. He is the recipient of national and international awards for journalism, design, and publishing excellence. James Lawrence lives and works in Shelburne, Vermont.